Is anybody else really ready for and missing the Fall weather? Or just anxious for it to get here? I sure am!! You know, having soups and stew on the stove top, fresh baked items coming out of the oven. That part of the fall is so wonderful and really something you can’t really do in the hot days of August in California. You have to keep your house open at night to get it cooled down and then close it up in the morning before the sun heats it back up. It’s hardly the time to turn on your oven or have something simmering on the stove top.Well, the couple last nights have cooled off early here and quite nicely, so I took full advantage of it to get my oven on! I wanted a wonderfully warm something from the oven that screamed of comfort food on cold days to me! A-Haa! My version of Bread Pudding! I've kind of changed the old bread pudding recipe to suit my tastes, and it has been a major hit with my Family and Friends. I prefer a real custardy(sp?) 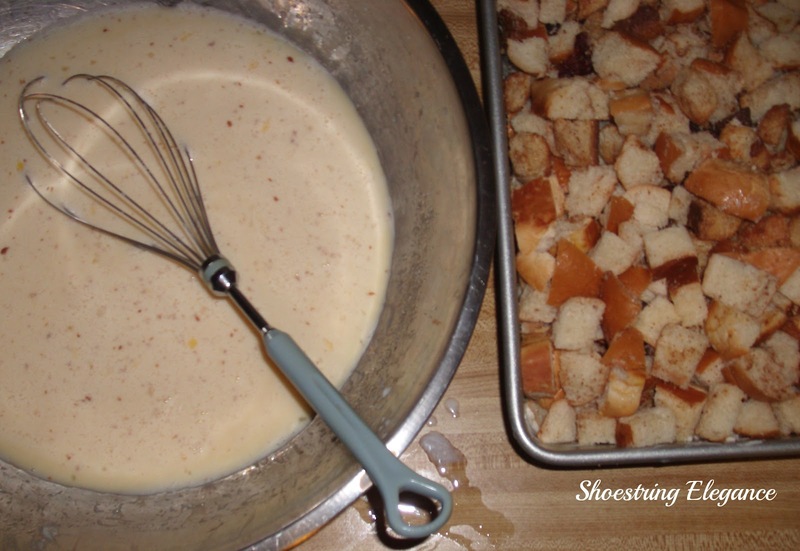 Bread Pudding, that’s not watery and not too crusty. Do you know what I mean? I don’t like using stale old bread. I actually go and buy my favorite honey-french rolls to make it! Any way, I’m sharing my recipe with you, which is something I don’t usually do, but it is just so good! I soak ½ cup golden raisins, ½ cup dark raisins, and occasionally I like to add ½ dried cranberries, in warm tap water and then put them in the microwave for 1-1/2 minutes and let them stay there until I need them. I cut my rolls into slices and then into 1 inch squares, about 8-9 cups of them. I put them in a large bowl and add my cinnamon about 1/2 tsp-1 Tbsp, depending on your taste. I use a level tsp of nutmeg and probably ½ tsp of cloves, but you don’t have to. Whatever flavors you like. You could do 1 tsp of each of the above mentioned ingredients. Or omit any you don't like. 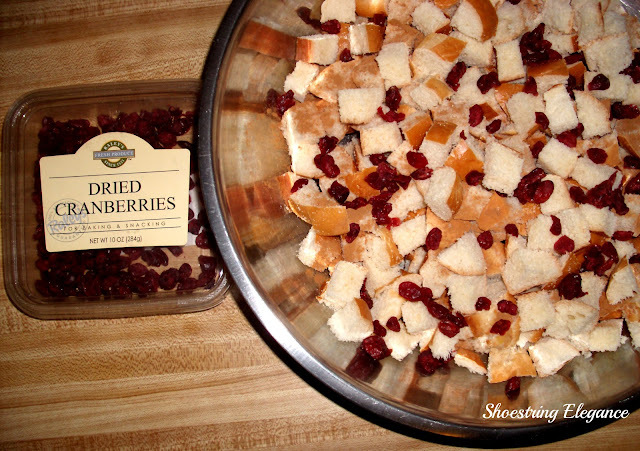 At this point I drain my prepared dried fruit and add to my bread mixture. I use my hands to toss them around, but you could use a wooden spoon, if you like. I melt ½ cup of butter just to a melt in the microwave and pour that, as evenly as I can, over the bread mixture. Then I turn this out into a buttered Lasagna pan, you know the one. Just a second, I’ll check the inches, okay mine is 9”x 14”. One final note, I think this is best when it's still a bit warm. You can clear wrap any leftovers and pop them in the micro for about 30 seconds for it to taste like it just came out of the oven. Thanks for popping over for a visit!! Your pictures are gorgeous! They make me want to go and find something yummy right now!! Thanks so much Lisa, your comment is much appreciated! Take it from me ..... this was so good that I would have tried to sneak it out of her house but then she wouldn't have invited my over next time she made it. p.s. (it gave me wonderful memories of my Nana) Thanks Theresa. Oh, Andrea, you are so sweet! Thanks so much! I know you and your daughter are going to love this, then! I always make too much so there's leftovers!! Just make sure to wrap and refrigerate. :) But you know that. Hugs back! Mmmmm. those sound good, I hope you share, when you get them made! Found you via Made in a Day. Following! Thanks Becca!I know, I'm not boohooing over summer, just hankering for some of the Fall comfort. That looks AMAZING!! I might still have to wait a few months here in Phoenix to "get my oven on!" :) I will totally be making this!! Thanks so much Ashley!! Thanks for coming over to check it out, I hope you try it when it gets a bit cooler! Thanks so much, Emily!! So glad to have you here!! I'll pop over and check out the giveaway!! Thanks for the heads up! I've never had bread pudding.. but that looks SOOOOO DELICIOUS! Thanks, Christina!! I hope you'll give it a try. If you do, Love to know what you think! I'm ready for fall too. Your version of bread pudding looks delicious! I hope you give it a try, Jennifer!! Yeah, I'm ready to "bundle up" instead of "strip down". Thanks for having me @ your party and for your lovely comment. I've never had bread pudding before. It looks good. I am SO ready for fall. Thanks for sharing. Thanks, Holly!! Give it a try, I think you'll like it! Gosh this looks so good!...I appreciate the way you explained the recipe.I'm visiting from Debbiedoo's. Thanks Jo! I hope you'll give it a try, It actually tastes better than it looks! My first time here. Visiting from Kathe's blog hop. I love bread pudding, although I can't tell when I had it last. I've already gained a few pounds just from admiring all the delicious food over at Kathe's blog (lol). Nice presentation too. Love the pink flower. Thanks for sharing. Hey, Andy, Thanks for coming by for a visit. 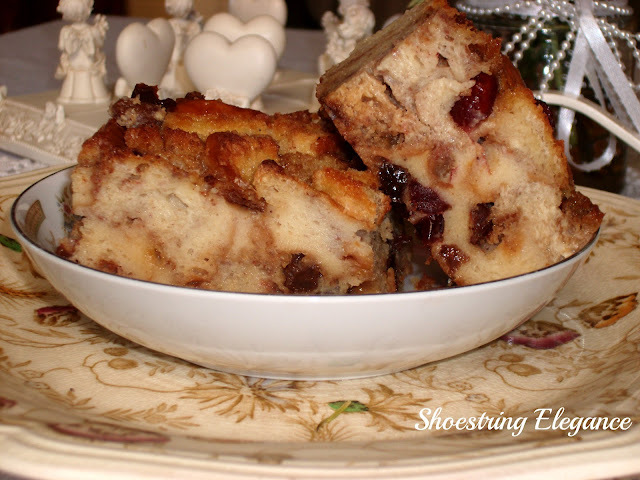 If you love bread pudding you have got to try this!! But, Ahemm, it is not low-fat to be sure. Since I do not cook much anymore, I would love having a big helping of your good cooking. Yum! Thanks for sharing your recipe. I love bread pudding! It's one of those old fashioned, comfort foods. I'll be sharing this on my Facebook page too! Thanks so much Kathy!!! LOL, Don't drool in your bread pudding!! I totally know the feeling though, the pudding is now gone and every time I come back to respond to these AWESOME comments..Well, let's just say, I kinda wanta make it again, SOON!!! I do enjoy a bread pudding and this one looks wonderful. I'll be pinning it to my sweets board. Thanks. Mmmmm. I love bread pudding! This looks really yummy. Thanks for sharing! I have never made bread pudding before and it has been years since I have eaten it. But after seeing this I will have to try it, this looks wonderful. I am also a big fan of bread pudding! It really is comfort food at its best. I might make some soon-thanks for your recipe! This just looks amazing:) My sweet Fellow loves Bread Pudding and I bet he would really go for yours. I nominated you for a fun award so when you get a chance drop by for the fun details. You are being featured on The "Sunday Stop" tomorrow. Come by a grab a featured button!!! This will be pinned on my board on Pinterest! Bj, You are too kind.. Thanks so much for including me in, your always wonderful Features!!! Can't wait to link up some more with you. Oh and you are pinning it too. Yippee for me!! Thanks again, still a big follower and admirer!! I love bread pudding and yes, I am ready for fall. Thanks for sharing this at Wow. It will be featured tomorrow night. Kim you are to sweet!! I really do hope you like it and will try this recipe! Thanks so much for the Feature and showing me your wonderful "Bloggy Love"! I have never made bread pudding but this looks delicious. (and I am so not ready for Fall, have too many summer projects to finish first. )Thanks so much for sharing on Tout It Tuesday. Hope to see you tomorrow. That looks yummy! Thanx for sharing at THT! Dear Theresa, this is so funny because I became your follower today, over another post I read. Then I found you again at the Stuff and Nonsense party! Congratulations on being featured! 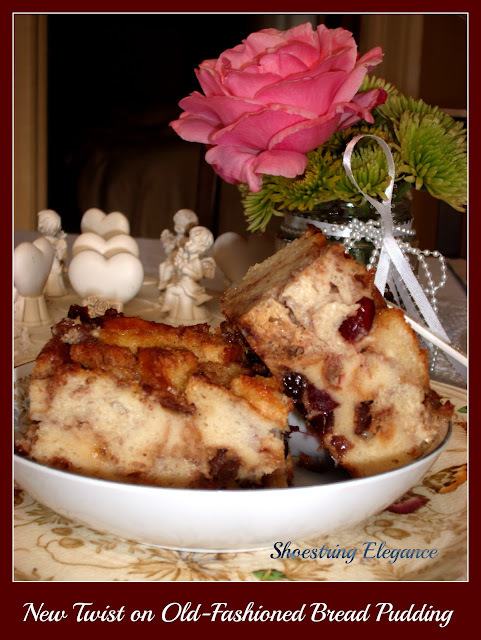 I love bread pudding and this looks so yummy! I know where to come next time I make one! I tried once or twice but mine came out dry... I will follow your recipe! Thank you so much, Claudine, for your lovely comment and for the new follow! !